Susi and I had barely got our diving gear dry from our trip to Zenobia before it was the time to leave for another dive, this time to check out Kaatiala Quarry and try out some cave diving. 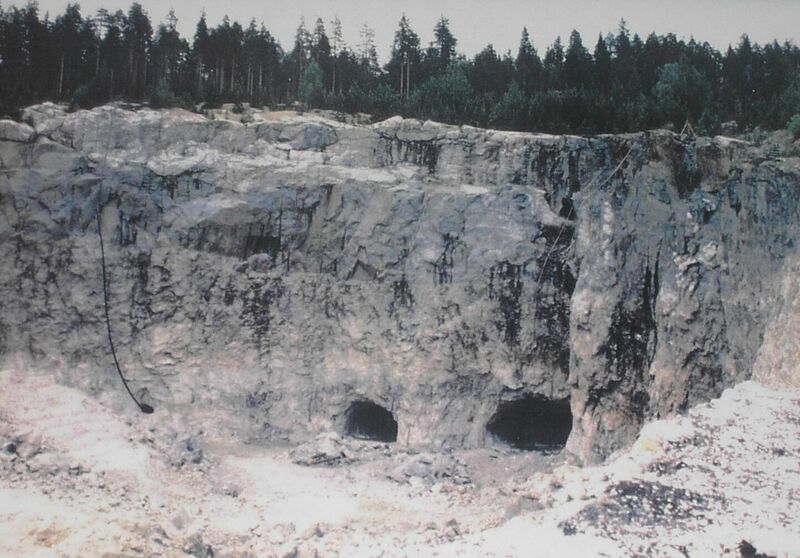 The quarry was operational in 1942-1968 and it produced quartz and feldspar, but after it was closed down people still collected stones that were used for jewelry. The quarry is about 200 meters wide and 30 meters deep, and it has a small cave system that reaches some 85 meters into the stone horizontally, about 40 meters deep. Susi peeking into the smallest entrance to the cave system. Our old colleague and study pal had invited us to visit the quarry and stay overnight in a nice cabin next to the place, which is favoured by divers. There was also a bunch of guys doing the IATND Cavern Diving course staying in the cabin, so we got to overhear a little bit of what we can expect when we do that course in the future. We were originally meant to stay there over the weekend and do a couple of dives on Saturday with our single tank gear, and try double-12 bottles and a Hogarth rig on Sunday, but unfortunately Susi developed some ear trouble (and our car developed some ignition trouble) so we had to abandon Sunday’s plans. I had also masterfully forgotten to charge my lamp battery and also forgot the charger home, but luckily one of the guys had bought a spare lamp that was bright enough to use a primary. Getting a loaner lamp was great, since without it we would have had to forget our plans of peeking into the caves. Susi and I are certified to go down to 40 meters and we just got our wreck certifications, which means that we can go inside wrecks to within 40 meters of the surface, or as far as the daylight carries. This means that if the wreck is 30 meters deep, we can enter 10 meters into the wreck on our own, and so on. In Finland the daylight requirement is a bit harsh, though, since the water is usually so murky that every dive under 15 meters or so is a night dive. We try to be quite careful about diving within our certifications, since the surest way to get a lungful of water is to overextend yourself, especially by going into an overhead environment underwater without good training. There has been one fatality in this dive location too that was the result of pretty much just that – ignoring safety rules and certifications. We talked about our plans and decided to go and see the caverns and decide, if it looked safe enough before going in. Our estimate was that it would be as safe as we could make it if we did it like a wreck dive, following the same protocols. When I went down to the quarry, the first surprise was the visibility, which was several meters. According to the people who’ve been diving there more, this was bad for the place, but even as it was it was quite nice. The second surprise were the glimmering rocks and rock walls down there. Going down to the greenish black darkness I was surprised to see the rock walls gleam in the lamp light. 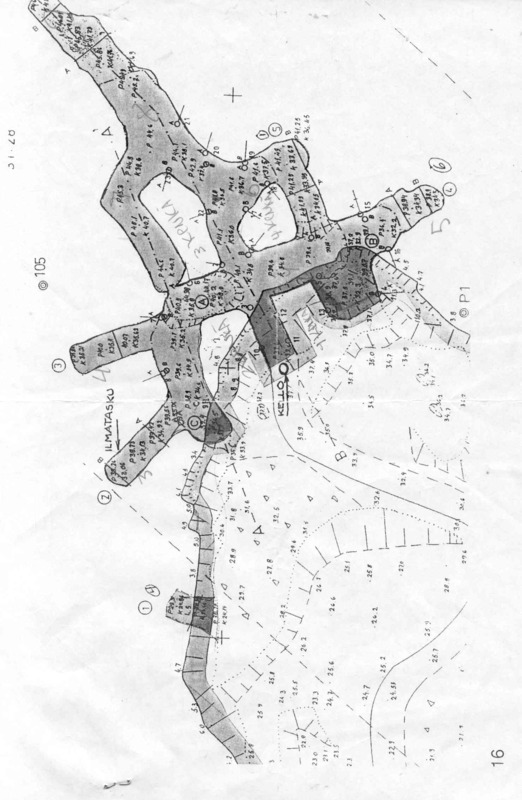 Both the walls and single rocks in the bottom of the quarry had metallic facets and veins in them that reflected the dive light and flashlight like little pieces of mirrors. As a movie prop or computer game graphics it would have looked a bit contrived, but seen live it was really beautiful. Some of the stones looked almost like movie props. On our first dive we checked out the cave entrances and did a tour of the quarry. There’s all kind of weird junk down there, ranging from a broken laptop to self made small bathysphere (or a diving bell, rather) and a model plane that’s about 4-5 meters long. There’s apparently a car of some sort down there too, but that one we didn’t find. Susi did a good job navigating, because after a largish loop we ended up right under the wooden pier we used coming down to the water. A four by five meter model plane made of metal - a perfectly logical find in a depth of 30 meters. After the dive we felt confident enough to try and check out the cave. After some food, coffee and recuperation in the cabin we headed back to the quarry. There are three entrances to the cave system, all of which come into the same antechamber, which has several entrances deeper into the rock. Our plan was to take the rightmost entrance that is the largest, tie off a line and go in about ten meters, which we measured and marked on the line with a knot. There were fixed ropes in place which one could follow, but we didn’t want to rely just on them, because we really didn’t have a clear idea of where they went. All in all, our first time inside a rock went reasonably well. There was some hassle on the entrance when Susi was looking for a suitable place to fasten the line, and we managed to kick up a bit of silt. Following the rock wall there weren’t many chances to do secondary tie offs that we recognized, so I was doubly careful to keep the stationary rope in sight all the time. Additionally if we covered our lights, it was possible to see a very faint glow from the entrances. We made it around the corner and into the middle entrance into the cave system before our 10 meters was up and we turned around. It's easy to believe people kept finding rocks for jewelry here even after the quarry shut down. As cave dives go, it was just a little peek in, but still impressive. The caverns were wide and the water was clear enough to reveal the jagged rock above and around us, the metallic veins and facets gleaming in our torch lights. I didn’t have a camera in there, since I wanted to concentrate on diving completely. All in all, after the dive it was clear how much more training and equipment is needed before it’s even time to think about going any deeper into a cave like this. After coming out of the cave we spent the remaining bottom time exploring the quarry. We veered a bit off course, and since part of the quarry was still covered with thin ice, we decided to get up immediately. There was no real danger there, but better to be safe than sorry. So we surfaced some 40 meters away from the landing, in to a nice evening sunshine peeking over the fir trees. Like little shards of mirror. It was clear for both me and Susi right from the beginning that diving in wrecks and caves is what we’ll want to do in the future, and now within a week we got to try both of them. That initial impulse was not wrong: now it’s just a matter of time and money to go to the proper training and get the proper gear, and it’s back into the rock and rusting iron for us! Oletko muuten lähdössä Saarenmaalle kesäkuun alussa? Todellakin, juuri näin – meistä kummallakaan ei ole mitään hinkua päätyä sukellusonnettomuustilastoksi. Mietimme tovin, että kannattaako edes tätä pientä kurkistusta tehdä, mutta totesimme, että ehkäpä uskallamme tupla-naruvarmistuksella ja kohtuullisen hylkykoluamisen pohjilla kurkistaa tuon verran sisään. Kiintoisa blogi sinulla, täytyypä laittaa lukullistalle. Ja jep, olemme lähdössä Saarenmaalle. Jep, vaikka kaikki meni hyvin, vaikka kartasta ja Kaatiala-veteraaneilta oli katsottu että ei ole mahdollista eksyä sillä pätkällä mitä aiottiin sukeltaa, silkka jänskätyksen määrä sillä kymmenellä metrillä todisti että ei ole kyllä mitään halua, tarvetta eikä asiaa lähteä kiven sisään seikkailemaan ilman kunnollisia välineitä ja koulutusta.